Once again this is a book for beginners in bead crochet. The directions for the stitches are clear, and could be more plentiful, but aren’t. At the same time, this book would be good for beginners because they wouldn’t be intimidated by the scope of the projects or the difficulty. As a primer for crocheting with beads, I think this is where the book would find it most usefulness. 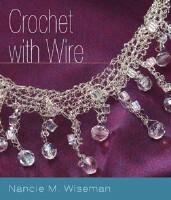 If you’ve never crocheted with wire there is valuable information. It is not like fiber and once it is bent, while a little might be taken out, you need to plan on doing it right the first time. The tool section is quite good, also. I would have liked to seen more drawings for how the beads sit when ‘popped’ through the stitch and how they look. I think beginners can “get it,” but it would have been easier if the drawings had been more copious. There also is a gradation of skill levels that I found misleading. Just because a granny square doesn’t repeat every stitch doesn’t mean it is difficult, but that was the premise of the book. Again I found the photography to be uninspired and without much clarity. I expect much better than this from Interweave Press and was disappointed to see it. We are glad for the generosity of Interweave for giving a copy of this book to our library for reference.